Our campus feels friendly and welcoming. While we've grown from our 1960 founding class of 800 to our 2017 fall enrollment of 10,003, we treat you like there’s only one of you. Most classes have fewer than 22 students - more chances for one-on-one with your professors. ...and studies have shown creating lifelong connections in college will help you succeed academically and professionally. 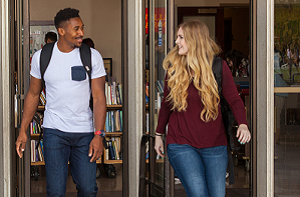 Build relationships with your fellow classmates, faculty, staff and community during your time at Stanislaus State by participating in all that our University has to offer. Join clubs and organizations, participate in student leadership, become active in Associated Students Incorporated or University Student Union, or attend workshops and events. Select from the wide array of majors we offer. While we're well known for our business administration, teacher education, and nursing programs, we have 43 undergraduate programs, 15 master’s programs, seven credential programs and a doctorate in educational leadership. Need more time? With more than 2,000 courses, explore your choices before deciding on the major that really suits you.